ENVOS wins Best Community Pitch at ESTO Awards Ceremony | Envos, s.r.o. 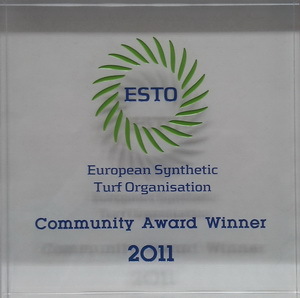 Cologne, October 27 2011 – Envos and GreenFields are the proud winners of the ESTO Award for Best Community Pitch for the football pitch in SK Újezd (Prague). The football pitch has become a catalyst for regeneration of the community. Such is the success of the new pitch that the European Synthetic Turf Organisation (ESTO) has awarded the pitch its prestigious Community Award at the Annual Awards Ceremony held in Cologne, Germany. SK Újezd was formed in 1937 and is the only football club in the local area. Having only one grass pitch and with poor drainage, the pitch was often unplayable, restricting usage to just two adult teams. Fixtures were frequently postponed leading to rescheduling problems. In addition, the local council was concerned that there was little to keep youngsters in the village and that people were moving away. In 2008 the community came together and decided that a new artifical turf pitch might help to grow the number of football teams in the village and provide more activities for children. With funding support from the local council and direct help from local people, the club managed to raise enough money to install a new artifical turf pitch, install floodlights and build a new clubhouse. The community were also helped by Michal Bílek, the Czech National football team coach who supported the development. Envos installed the artificial football pitch in 2009. Having previously had the capacity for just two teams, the new pitch now offers the opportunity for twenty two teams to play regularly, a ten-fold increase in capacity. The club has expanded to operate youth and girls teams across the age range. Showing that the pitch is for the entire community, the club has developed a number of ‚masters‘ football teams for the over 40’s, over 50’s and over 60’s. The club also operates children’s soccer camps daily in July and August each year. With the revenue generated from a new restaurant on site, along with a steady income from pitch rental, it has allowed the club to invest in new teams and build the capacity of the club. This is something that simply could not have happened with a traditional grass pitch. The pitch is able to withstand prolonged usage due to both the high quality construction and the specially developed maintenance programme carried out by Envos to ensure that even with heavy usage the pitch remains in a first class condition. This maintenance programme has been a critical contribution to the success of the pitch. Photos from awards ceremony can be found here. Photos from the reconstruction SK Újezd can be found here.